"I learned this recipe from an Italian chef in Florence. 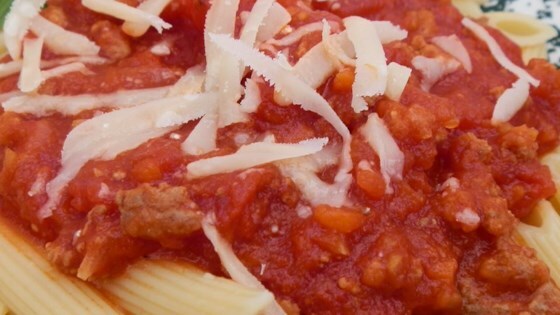 It is a wonderful meat sauce of ground beef and pork, originally served over a homemade ricotta and eggplant ravioli. It's great over spaghetti and fettuccini as well!" Heat the olive oil in a saucepan over medium-high heat. Cook the onion, carrot, and celery in the hot oil until the vegetables are tender and the onion has begun to brown around the edges, about 5 minutes. Stir in the beef and pork; continue cooking and stirring until the meat is brown and crumbled, about 5 minutes. Pour in the wine, bring to a boil, and cook until the wine has nearly evaporated. Add the chopped tomatoes, tomato paste, salt, and pepper. Reduce heat to medium-low, partially cover the pan, and simmer 2 hours until the sauce is very thick. Use a little water as needed if the sauce begins to look too dry. I followed the recipe exactly and our family really enjoyed it. Would like to try it with some garlic and fresh basil next time.